When I started school at URI in 1966 the only road to get there was a small winding road. I would pass a falling down house situated on a charming spot. 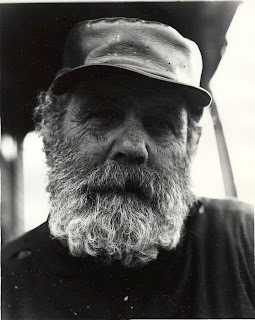 One day I found the courage to knock on the door; thats how I met Bill Lacy, the hermit of Narrow River. He wasn’t really a hermit; he just couldn’t get around very well as he had no car and there certainly was no bus passing by. 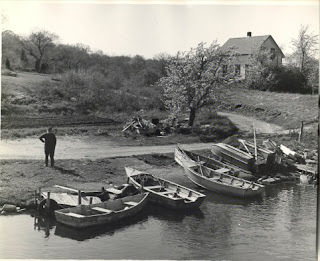 The skiffs in the photograph were one of Bill’s only source of income, you could rent one for a quarter a day, to go rowing or fishing on the river. 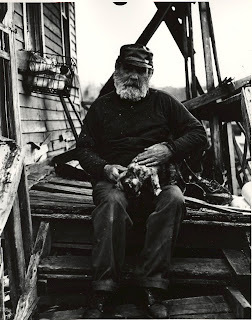 The photo of Bill sitting on the steps of his house with his cat, tells quite a story. 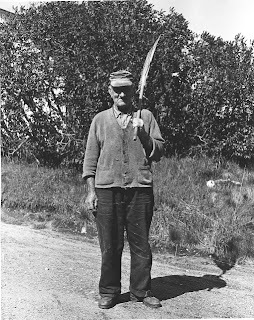 The man with the rake was Bill’s nearest neighbor, they didn’t speak. His source of income was smoking pogies in his outhouse. I was never certain if he revealed this to his customers. The day Bill died his house was bulldozed and it was as if he had never existed. Thanks for the memories your photos evoke. The guy with the shovel is Bill Yoman. He and his brother Joe lived on the farm next to Lacey’s. In the 50’s I spent childhood summers in the homestead across the street from the Yoman farm. On summer nights I would hang out at the bridge with other kids listening to Bill Lacey talk on into ther night, tall tales all the way. Bill Yoman was wonderful. Joe was unique. I knew them all until they passed in turn. My aunt still lives in the corner lot across from Lacey and the Yomans. whoa. Bill Lacey was my dad’s uncle. this post made my night. for a narrow river character.